The watch company Cyrus has presented at the GTE 2012 two new additions to Klepcys and Kuros collections. The novelty of the Klepcys line is developed in collaboration with Jean-Francois Mozhon. The release of the new item is limited to 33 instances. New Klepcys is based on a manufacturing automatic mechanism CYR598, consisting of 456 components. The power reserve of the mechanism, assembled on the 37 jewels, is 40 hours. The carrying frequency of the caliber is 28 800 vph. The caliber provides a unique time display on a mobile axis with retrograde hours. And the watch is also equipped with an indicator of “day / night", a large calendar with retrograde rotating three-dimensional scale of tens of discharge, the spherical image of the moon driving the shutter to indicate the changing phases of the moon. The case of the model with a diameter 48 mm, including crown, is made of 18K red gold and titanium with black DLC-coated. The case back in the form of a medallion is a replica of the original coins more than 2,500 years ago, issued during the reign of Cyrus. The novelty comes on an alligator handmade chocolate strap. The release of the new model in line of Kuros is dedicated to the participation of Cyrus at the upcoming 8th race Grand Prix Historique De Monaco. The watch brand will take part in the competition with his own car. The great design of the model follows the contours of sports car. To create rubber straps will be used rubber of the machines’ wheels, which will participate in the races. Each model is included a bracelet made by brand Albanu. The watch will be released in a limited number of 99 items and will be available from May 20, when it will be possible to use the rubber of the wheels to produce straps. The famous football player Mesut Özil, who plays for Real Madrid and the German national team, has become the new ambassador of the Swiss watch company Cyrus Genève. Henceforth the exclusive chronographs of Cyrus will be gracing the athlete’s wrist during his performances. Swiss watchmaker Cyrus specifically for a charity auction Only Watch 2013, which will take place on September 28 in Monaco, has launched a unique new model Kambys. The company Cyrus has recently became a partner of W Motors (W - wolf) - a Lebanese car brand, the first Arab manufacturer of luxury cars in the Middle East, which has brought together engineers from Magna Steyr Torn and designers from Studio Torino. Is there life on Mars or not – science doesn't know it. This popular saying is easy to refute. Today's scientists have proved that life on the red planet exists and there are even produce watches named Klepcys Mars! 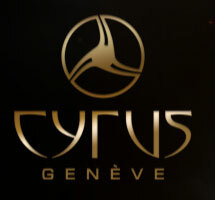 The maker of chronograph is Swiss company CYRUS. Information watch portal Pam65.ru time provides a unique opportunity to all lovers of the complex and amazing watch making, which are closely watching for its latest trends, innovations and ideological incarnations, to see the magnificent and certainly deserving of special attention models of the watch company Cyrus, which the company proudly presented at GTE 2012.